Book of Crazy Chicken whisks you away to ancient Egypt where you can explore the tombs of the pharaohs together with the adventurer, who also happens to be a chicken... and so is the mummy! 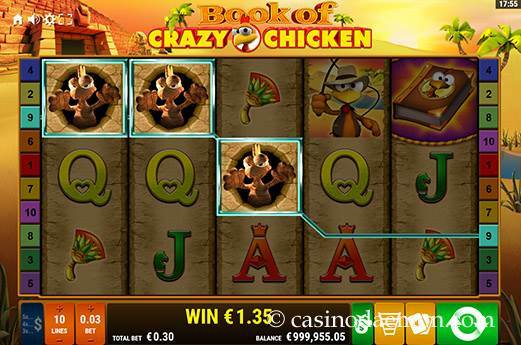 This funny game features comical symbols with an Indiana-Jones-type chicken and other items relating to Egyptian history. The slot is reminiscent of the popular slot Book of Ra, in case you were wondering. The game features wilds, scatters and free spins with a special expanding symbol. The variance of the game is medium, and you might have to play the game for a little while before the free spins start. However, once you manage to trigger them, they can really make it worth your while. 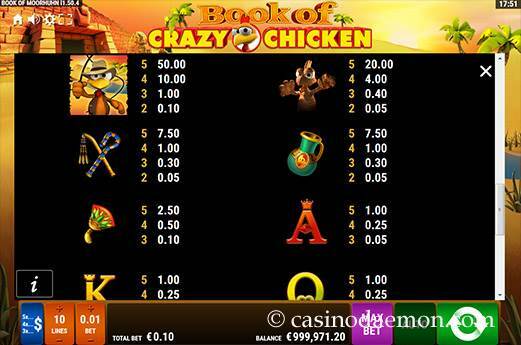 The slot Book of Crazy Chicken is also available for mobile devices and you can play it on the go. Do you fancy joining the chicken on his adventure to ancient Egypt? 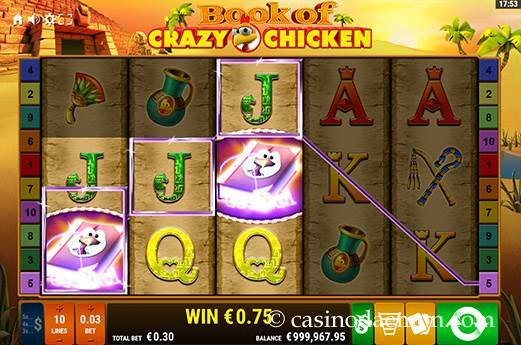 You can play Book of Crazy Chicken for free on this page, and if you want to play it for real money you can find in the casinos listed on this page. The game has several features, starting with the book wild symbol, which is also the scatter symbol, and can award a payout regardless of the position on the paylines. A minimum of three scatters award 10 free spins, but before they start a random symbol is chosen as the bonus symbol (can be any symbol, except the book wild). If you get 2 or 3 of this bonus symbol, depending on the chosen symbol, and if you get a winning combination, the winnings will be calculated, the bonus symbols will expand to cover the entire reel, and you'll get another win paid. Bonus symbols count as scatter symbols. You can also trigger additional free spins with more scatter-wilds. When you get a winning combination, you can also potentially stake the win in the gamble. Choose from the card or ladder gambles, and you'll get the chance to increase the win, or lose it all. The gamble is not available for high wins, or in automatic play mode. 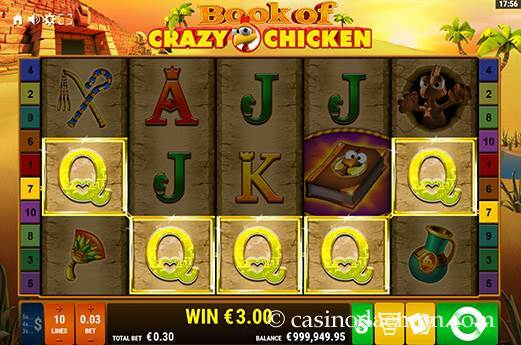 You can play Book of Crazy Chicken with stakes from £/$/€ 0.05 up to £/$/€ 6. The slot has 5 reels with 3 rows and you can select to play 5 or 10 paylines. Coin values for the paylines start at £/$/€ 0.01 and reach £/$/€ 0.60. Automatic play is also possible.